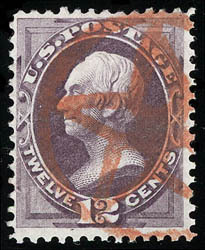 Star within Star, bold strike in Supplementary Mail red on 12¢ dull violet (151); light crease, fresh and Very Fine appearance; with 2002 P.F. certificate. Weiss No. ST-MP1 Estimate $150 - 200. 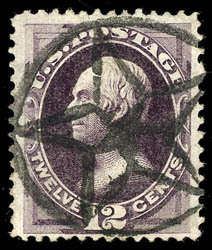 Star Within Star, bold central strike on 12¢ blackish violet (162), well centered with wide margins; small corner creases, Very Fine appearance with a choice strike; with 2004 P.F. certificate. 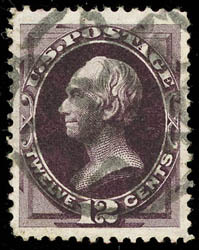 Multipoint Star, bold central strike on 12¢ blackish violet (162), well centered within tall margins, rich color on bright paper; small thin spot, Very Fine appearance, ex-Braden; with 2003 P.F. certificate. Weiss No. ST-MP3 Estimate $150 - 200. 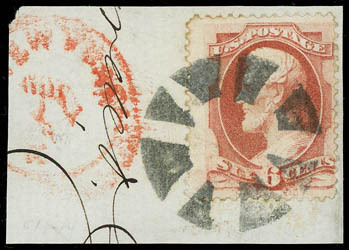 Star in Circle, two full strikes in red on 1873, 6¢ dull pink (159), horizontal strip of four, exceedingly well centered throughout, bright and fresh, small flaws, Very Fine strikes of red Supplementary Mail cancels on a large multiple. Weiss No. ST-MP1 Estimate $300 - 400. 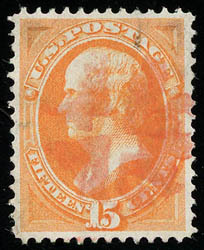 Cross Roads, strike in supplementary mail red on 15¢ bright orange (152), well centered with bright color and paper, Very Fine and choice; with 2003 P.F. and 2008 P.S.E. certificates, latter graded 85 VF-XF. Weiss No. TR-C1 Estimate $200 - 300. 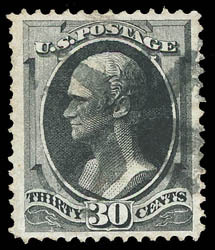 Flying Clothespins, bold strike on 30¢ gray black (165), excellent centering within large margins, strong color, Very Fine; with 2005 P.F. certificate. Weiss No. TR-C7 Estimate $150 - 200. Radial Star Geometric, complete strike on 90¢ carmine (155), nicely centered on bright paper, a Very Fine strike of this rare cancel on the 90¢ value. Weiss No. TR-M6 Estimate $200 - 300. 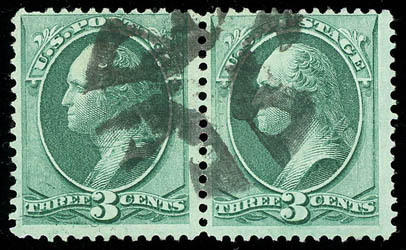 Geometric, cancels 3¢ green (158) horizontal pair, some light creasing, Very Fine strike on a pair. Weiss No. TR-M7 Estimate $150 - 200. 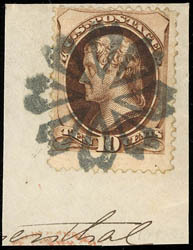 Circle of Hollow Wedges, perfect bold strike ties 10¢ brown (161) on small piece, small stamp flaws, Extremely Fine strike; with 2003 P.F. certificate. Weiss No. TR-W5 Estimate $150 - 200. 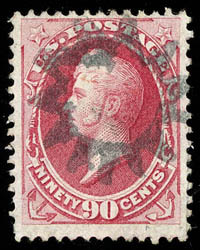 Truncated Circle of Wedges, perfect bold strike ties 6¢ dull pink (159) on small piece, red "New York" exchange cds at left, Extremely Fine strike; with 2003 P.F. certificate.